Kathakali literally means: “telling stories”. A Kathakali show lasts an entire night; it begins at sunset and ends at the first light of dawn. In India there are different forms of classical dance theater. 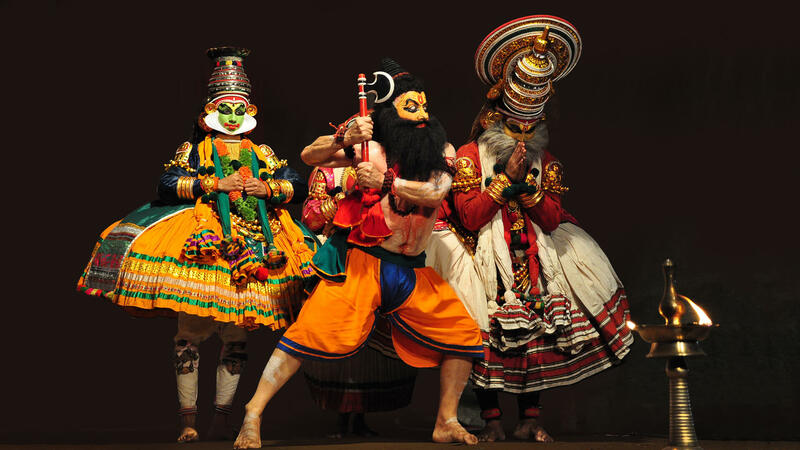 Kathakali is among these, one of the most important and known. Made famous, respected and respected in the West, especially for the rigor and precision of his training, he has fascinated great masters of Western theater, such as Jerzy Grotowski, Eugenio Barba, Peter Brook, Ariane Mnouchkine. Kathakali is a great theatrical machine that, through a practical study, has shaped the dancers since they were children. It is a total work, a combination of theater, music, dance, song, text, make-up, costume (also to be understood as a set in motion). The construction of the character is based on the decomposition of the body into bands or blocks: upper and lower part, in turn further subdivided up to micro details. An example, in this sense, consists of the Kalasha of the eyes, rhythmic sequence in which the eyes in the foreground, dance. This decomposition of the body translates into an integral and harmonious vision for the viewer. In Kathakali you get the maximum result when the actor-dancer succeeds in “making poetry visible”. The epic of the stories coincides with the epic character of the training to which the actor / dancer is subjected. Meyurapadavugal (learning of the whole martial part). The mudras (alphabet of the hands – 24 positions). Churippu (exercises for the dissociation between the upper and lower parts of the body). Kalasham (Tandava and Lasya pure dance sequences, masculine and feminine).